A teenager found hanged in his school's grounds intended to take his own life, an inquest has concluded. Derek Brundrett, 14, had been the subject of two failed attempts to refer him to mental health services before his death in December 2013. Assistant coroner Paul Bennett said that the suicide was a "deliberate act" and not a "cry for help". Speaking after the hearing, Kristina Wray, Derek's mother, said she hopes "lessons will be learnt". 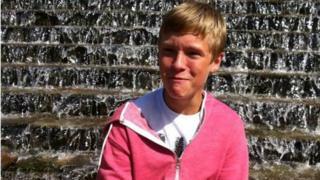 The teenager was discovered by his friends at Pembroke School, the inquest at Milford Haven Coroner's Court heard. He was discovered near the school's reception after being sent out of class. The inquest heard that Derek had been assigned several different social workers and foster carers, and had attended three schools in just under two years. He had previously spoken about suicide and self-harm, but was not deemed to be a severe enough case for Scamhs (Specialist Child and Adult Mental Health Service) to take on after GP referrals, the inquest heard. The coroner said one of Derek's social workers had failed to refer him for psychiatric support when there had been an opportunity to do so. But Mr Bennett ruled that no services involved in the case could be accused of "systematic failure". "In my view he had no intention that anyone should find him in time to save him, only that he would be found, probably by his friends," he said. After the inquest concluded, Ms Wray said: "They failed my baby. They failed me and they failed my son. So where to go from here I'm not 100% sure. "I sincerely hope that lessons will be learnt so other children won't be failed in the same way." Dr Warren Lloyd, of the Hywel Dda University Health Board, said it accepted the inquest findings and had taken the case "extremely seriously". He said: "We have undertaken significant work over the past few years in line with Welsh Government investment into Specialist Child and Adolescent Mental Health Services to further develop and enhance frontline services. "This includes the introduction of a central point of referral pathway and a dedicated crisis service within west Wales for children and young people presenting with mental health emergencies." He added: "The health board is offering to meet with Derek's family... to further reflect upon the lessons learned..."
Pembrokeshire County Council also said it would reflect on "lessons learned". "The death of a child is a profound loss, and all the professionals involved in this tragedy feel great sympathy for Derek and his family and friends," it said. Mr Bennett also apologised to Derek's family for the time it had taken to conclude the inquest, which began hearing evidence two years ago.